I have always wanted really cute Christmas plates, but whenever I saw any I liked, I couldn’t bring myself to pay for them. So…I decided to make my own, and get this…not only are the SO easy, they only cost $1 each! I love love LOVE how they turned out! And it was so simple. It literally took me 20 minutes, plus the baking time. Can I just tell you how much I adore projects that are quick and simple and super cute? I found the plates at Dollar Tree for $1 each, and they’re by Royal Norfolk. They seem to carry that brand quite often, and I’ve bought them there for years. They’re really nice, heavy duty plates that are perfect for entertaining and guests! You can make enough plates for 12 people, for only $12! I didn’t paint in the center of the plates, because I didn’t want to worry about them being food-safe. I’m kind of obsessed with polka dots, and I thought they would not only be fun at Christmas, but all year long! You could also use a paintbrush to make stripes around the edges, or other stencils too–whatever you like! 2. Once they are all polka dotted, follow the paint directions for curing. I used Martha Stewart Multi-Surface Paint, and I had two options: curing for 21 days, or baking the oven. I’m super impatient, so I went with the oven method. I placed the plates in a cold oven, then turned the temperature to 350 degrees. I baked them for 30 minutes, then turned off the oven and let the plates cool inside. Once they cure for three days, you’re ready to go! They’re even dishwasher safe, which is awesome. But…make sure to read the directions on the paint you choose, because the curing process could differ. That’s it! Seriously, SO simple and easy. I can’t wait to use them! Dinner parties, family parties and get togethers, Christmas Eve or Christmas dinner…they’ll be the perfect touch! What a fun idea. I can’t wait to give it a try. Love this! We have plain white plates, so maybe I’ll just fancy them up! Cute idea! Dollar tree even has pretty plates that are already decorated for Christmas. I like this idea too so you can personalize them! The personalization is what makes them so fun! Maybe even mix and match! 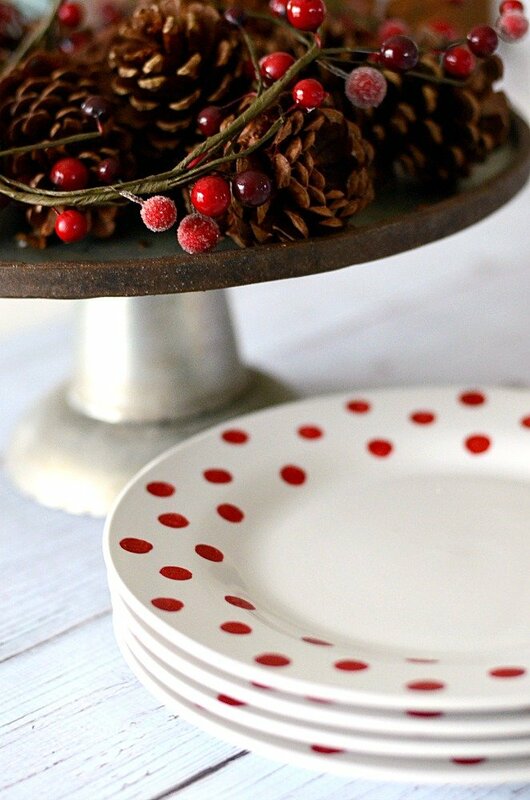 I love polka dots too, and these plates are seriously adorable! Totally love this idea! What a darling blog! I want to make these plates for my visiting teachees. I love your prayer rock by the way, that’s what brought me over to your blog – – I just couldn’t figure out how to comment over there. I am going to be stalking you lots now that I found you, haha! Thanks for sharing your creativity and passions!! I love this idea! I have always wanted cute Christmas plates too. I am totally making these! I love these plates!! They are so cute and you can never go wrong with polka dots!! Love them!! Can you wash them in the dish washer without the paint coming off? Yes, if you use the right paint and follow the directions for curing! I usually wash mine by hand, but you can put them in the dishwasher! Is this paint microwave safe? If not, do you know of any that is? I’ve looked at several different brands, and I haven’t seen any mention of whether they’re microwave safe or not. They only mention oven and dishwasher, and I would think if they’re save in the oven, they would be safe in the microwave, but I can’t say for sure. I think to get a definite answer, you would need to reach out to the manufacturer. If you find out, let me know!! I would think that oven safe also means microwave oven safe, since technically they are both considered ovens!?!?!! And such an amazing idea! I’m going to be doing this for every holiday!!! This is awesome!!!! I love this. I love your site. I just subscribe. I am going to do this project for my friends, home and visiting teachers. Thank you for sharing with all of us. Very cute! Can you use these plates to eat off of? Yep! I only put the design around the edges, so there wasn’t any paint in the middle of the plate where the food goes. As long as you don’t put food on the edges of the plate where the paint is, you’re good! Getting ready to make these adorable plates but wondered what size foam round sponge did you use? I did a sample plate with 1/4″ round sponge but the polka dots look a little big. Thanks for all your terrific ideas! Actually, I think it probably was around 1/4″ sponge, but unfortunately, it was lost in our move. It could have been a little smaller than that, but my dots are pretty-good-sized. The rims on my plates are large, so the sizing might look a little different. I’m so sorry, I wish I could be more specific!! Good luck!